One of the most numerous insects (order Hymenoptera), characterized by an extraordinary development of colonial dwelling and caste specialization. Any of numerous hymenopteran insects of the family Formicidae, characteristically having wings only in the males and fertile females and living in colonies that have a complex social organization. A gene on chromosome 4q35 that encodes a mitochondrial solute carrier protein, which functions as a gated pore that translocates ADP from the mitochondrial matrix into the cytoplasm. SLC25A4 forms a homodimer embedded in the inner mitochondria membrane. SLC25A4 mutations cause autosomal dominant progressive external ophthalmoplegia and familial hypertrophic cardiomyopathy. Fig. 37 Ant . 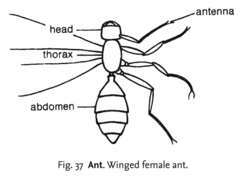 Winged female ant. any insect of the family Formicidae of the order Hymenoptera, characterized by a narrow abdominal construction. All ants are colonial and each colony may contain several castes (specialized individuals). The queen is the only egg-laying individual, fertilization taking place during a nuptial flight involving several colonies. The queen then sheds her wings and starts a colony in which workers are wingless. Social activities include the tending and milking of APHIDS. See Fig. 37 .
ubiquitous insects, which, among other things, act as intermediate hosts for the trematode Dicrocoelium dendriticum and cestodes Raillietina spp. recorded in calves and recumbent animals attacked by fire ants (Solenopsis invicta).